Find hotel near Iglesia De San Pedro Clav ..
San Pedro was a Spanish Jesuit priest and missionary who became the patron saint of slaves and seafarers. In Christianity, he is considered to be one of the greatest examples of what the exercise of human rights should look like. It’s said he personally baptised over 300,000 souls. Today, he is considered a national hero. The relics of the saint rest under the main altar of this Jesuitic-style 16th century church. 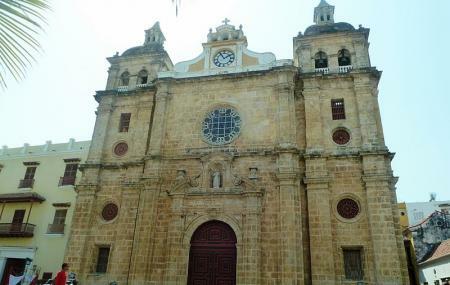 The facade of the church is said to be the greatest of all churches in the city. But also see the well in the courtyard, where he baptised thousands. The church museum dedicated to the saint was opened in 1950. The tour includes the apartments, and artifacts from his life. There's a small collection of religious art from Europe and Latin America, and also Afro-Caribbean art. There's even a small archaeological exhibit of pre-columbian ceramics. In front of the church is the pretty Plaza de San Pedro Claver. Lined with restaurants and charming artisan shops selling handicraft and jewelry, it is a delightful attraction in its own right! You’ll find a striking statue of San Pedro there. Other smaller statues depict the day to day life of the people. Buy food and drink from the street vendors. It’s a shady place, an excellent refuge from the heat. Park at Parque de la Marina. Lovely area. We were here on a red hot day but the good thing is there is a lot of shade about along with the odd street vendor. Steeped in history it is well worth the visit and the locals seem friendly. Cartegena felt safe with a friendly atmosphere. Peaceful retreat in a busy city. Many old icons of the catholic faith on display in a museum. A mini garden oasis in its center. The most beautiful gem of Corralito de Piedra. A shame that is almost always closed.